JNN 21 July 2014 Karachi : Youm-e-Ali was observed across Pakistan in high security on Sunday to commemorate the martyrdom of Hazrat Ali (AS) , which was peacefully observed throughout the country. 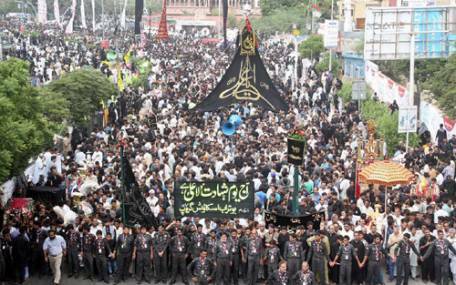 Mourning processions Were held across Pakistan to highlight the teachings of Hazrat Ali (AS). According to LEAs, security measures were adopted to tackle any unforeseen situation on the occasion. The processions were monitored by with close-circuit-cameras. Bomb Disposal Squads and sniffer dogs for clearance of the procession routes. All cellular road in the processions were blocked, whereas ban on pillion riding has also been imposed in major cities including Karachi, Lahore, Peshawar and other major cities. The procession in Islamabad was taken out early morning from Sector G-6/2 Qasre Zainabia and concluded in G-6/4 Jama Isna Ashari. In Rawalpindi, the procession, commemorating the death anniversary of Hazrat Ali, was taken out from Moghul Pura that concluded in Colonel Maqbool Hussain’s Imambargah . In Lahore, the main procession was taken out from Mubarak Haveli that culminated at Karbala Gam-e-Shah. The central procession took its traditional route from Mubarik Haveli and ended at Karbala Gamay Shah after passing through Bhaati Gate area. In Sukkur the Central procession on the Ocasssion of Youm Ali was taken out from Markazi Imambargah Ghareebabad which concluded back at Markazi Imambargah . In Ahmedpur Sial the Procession was taken out from Imambargah Husainiyah . In Karachi, Allama Talib Johri addressed a gathering at Nishter Park on the occasion. After the gathering, the central procession began from Nishter Park and reached Numaesh Chorangi. Zuhrain prayer was offered at Imam Bargaah Ali Raza on M.A. Jinnah Road , which concluded at Husainiyaan Iranian in Karadar. Strict security measures were taken to ensure the safety of procession. Around 16,000 security personnel were deployed throughout the route. Plus Scouts and Volunteers were also present to control any untoward Situation . Strict security was observed throughout the route. Police, Civil Defense and Rescue teams were along with the procession. Entire route and the adjoining roads were blocked by barbed wires. It should be noted that pillion riding has already been banned since Friday due to security reasons. The Only Untoward Incident which Happened in the Karachi Procession , when some Shia Female Participants of the Procession , came in the way of the procession and forced the Procession to stop , and Pressed their Demands that the Govt should Let them Know the where abouts of 3 Young Male Members of their families ,who were Picked up by some Unknown Intelligence Agency Members , when they were returning from a Picnic Spot in Karachi, and whose whereabouts could not be traced for the Last 25 Days . In this connection , the Shia Leader and Administration along with the Family Members of the Kidnapped Boys , Held a high Level Meeting on the side lines of the Procession , in which the City Administration assured the family Members and the Shia Leaders that as they are also Unaware of the where abouts of their Boys . But On Monday they ll definitely work to locate the Possession of those Boys , on this assurance the Administration and Male family Members included in the Meeting , agreed to dissolve their Protest Sit In the way of the Yom e Ali Procession . But as they returned and announced their decision , to the Protesting Women and the Young Boys , Present at the Protest Sit In , they Disagreed on the Instigation of some Miscreants Present at the Situation , who even tried to sabotage the Religious Procession on their Personal Matters , but on interference of the Some Community Elders and strong resistance from Group of Young and Sincere Community Members the Plan to Sabotage the Procession was averted . Finally the Protest Sit In was called Off , But due to which the Procession was about two and a Half Hours delayed from that Point, But finally it reached its destination Hussainian Iranian safely , about an Hour late . In Multan, the procession was taken out from Chah Boharwala and concluded in Astana Lal Kurti after Zohar prayers. The second procession was taken out at 3PM from Jawadia Imambargah. Collectively all the Processions across taken Out , with full Religious Fervor ended safely , and No Untoward Incident was reported. Which shows that the Establishment has Played a Key Role in the Maintenance of Law and Order across Pakistan , where at the same time Pakistan Army is conducting a Full Fledge Operation against the Terrorist Hide Outs and their Main Head Quarters successfully in the North Waziristan Region of Pakistan. And the Establishment has Once again Proved that if it seriously wants to establish Peace and Prosperity in the country , then they can enforce the writ of Law by force and No Power can come in their way . Now the Citizens of Pakistan are waiting to see the Operation , as per the Announced Plan of the Pakistan Army , that a Much needed Operation clean up , will also be launched in the settled areas of Pakistan , to completely wipe out the terrorists and their Networks , which are being all over the country , and their sleeper Cells are still , Active in the country , and specially Karachi , as the Target Killing has become an Unstopable Phenomenon , And an Army Operation is Much needed to eradicate the Remanants of Terrorism , in the Urban Parts of the Country , which in turn will automatically boost the economy of the Country , and thus Making Pakistan Prosper and Become the Asian Tiger of the World. This entry was posted in Asia Pacific, Jafria, Pakistan News and tagged Hazrat Ali, Karachi, pakistan, Religious event, Youm e Ali. Bookmark the permalink.